I’ve updated the eyeball tattoo FAQ today with lots and lots of new information, including some discussion of risks information that backs up doctor’s warnings that eyeball tattoos could lead to blindness. After meeting someone whose ink migrated into the inside of the eye, into the vitreous humor, and then after a year of floating around in their vision attached itself to the optic nerve, I collected more information on both this issue (which is probably rare) and on intraocular press and ocular hypertension (which is probably common). Short version of the story is that eye tattoos increase the pressure in the eye, which is connected to glaucoma and blindness, and this risk seems to get worse in time, so it’s possible that we may see the “perfect nightmare” of eye tattooing thanks to people not waiting and everyone wanting to jump on the boat and get it done too before the longterm risks were established… imagine if in fifteen to twenty years the incidence of blindness in those with eyeball tattoos is way higher than it should be. Not one bit of fun there. There has been at least one case where over-injected ink has migrated through the sclera and into the vitreous humor. In the case where this happened the eye didn’t seem to want to easily accept the ink, and what did go in seemed not to spread as normal. The other eye was tattooed in the same session without any complications, but three days after the procedure the person had what they described as the worst headache of their life including blurry vision and extreme light sensitivity. Intraocular pressure was increased, and for the next year the person saw black specks in their vision as these ink particle floaters tumbled through their vision. These particles appear to have now migrated to the optic nerve, which is their current location. The optometrist that examined the eye believes that glaucoma are likely and expects some degree of vision impairment or even blindness. It is also possible in this case for alternate complications to have arisen, and perhaps most importantly it is essential to understand that while experience and skill can mitigate this risk, it can not be eliminated and it can happen even to the most experienced artists (but is much, much more likely to happen to those who don’t have years of experience working on hundreds of eyes). Finally, I again want to emphasize that if anything abnormal is observed during the procedure it should be immediately aborted. …complications from the tattoo may lead to blindness in the future due to damage to the tissues of the eye and/or optic nerve. Beyond acute injury leading to blindness, the most likely types of blindness related to eye tattooing are believed to develop slowly, perhaps over several decades. It is also likely that eye tattoos amplify preexisting conditions, for example a familial predisposition toward eye diseases such as glaucoma, and that it will be difficult to determine the degree to which the eye tattoo is responsible for the vision loss. I also wanted to show three tattoos that have been done recently, all by different artists, that I like visually quite a lot. 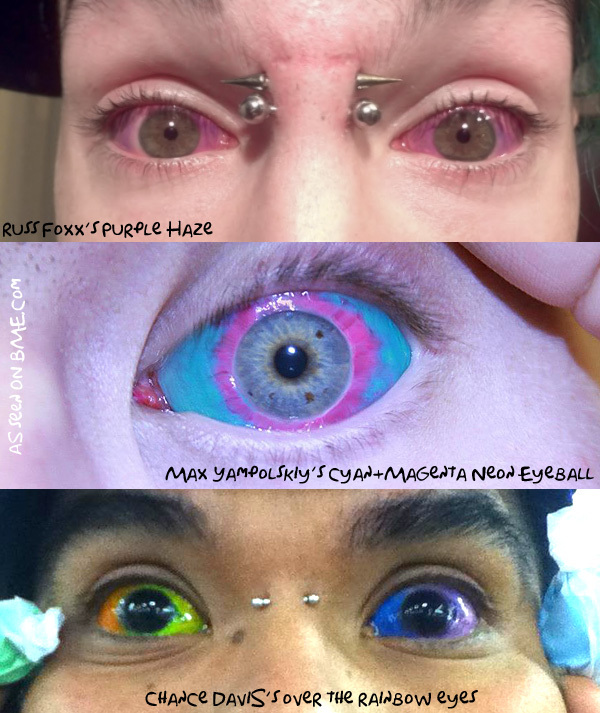 From top to bottom they are Purple Haze eyes done by Russ Foxx (done with an utter minimum of ink, which all other things being equal increases the safety level), , next a pair of cyan eyes with a magenta iris outline (this type of design should be treated with the utmost of care due to its proximity to the corneal limbus and iris/lens muscles, as discussed in the FAQ) by Max Yampolskiy, and on the bottom, a set of psychedelic rainbow eyes by Chance Davis. By the way, I assume this goes without saying but I need to make clear that just because I post a picture doesn’t mean that I endorse or recommend the procedure or the people involved… The risks on this procedure are still being discovered, and they may be quite significant. As much as I love the way these looks, it makes me beyond uncomfortable seeing how many people are getting it done, and how many new practitioners are not just diving into the procedure, but diving right into the deep end. Please treat this procedure with the utmost of care. It has more potential to severely damage someone’s live than just about anything else out there. This entry was posted in ModBlog and tagged Eyeball Tattooing, Risks by Shannon Larratt. Bookmark the permalink. Exactly. It looks incredible, but I have a feeling some bad things are going to happen (in the not so distance future). Not only are a lot of individuals getting it done, but a lo of practitioners are ‘jumping on’ the bandwagon you mentioned. I really hope ppl are thinking this commitment through. I like the way it looks but think that messing with sensory organs in this way is playing with radioactive fire. Eyes have evolved over millenia for their special circumstances (low/high light, pressure, etc.). It looks cool as hell but arbitrarily changing the color of the eye from white (reflects a huge amount of light) to something less light reflective seems like a super bad, bordering on crazy, idea. I won’t stand in anyone’s way if they want it done, but it seems like a huge f’n liability exposure for an artist to take and a huge physical rist for the person getting inked. im in love with the second set of eyes….wonderful. Sooo not worth it. Scleral lenses give the same effect without the risks. I can’t believe the chances people take with things like this. I’ve been legally blind since grade school, when I was 12 my vision was something like 20/3000 & I had to have special therapeutic lenses that reshaped my corneas. Even the eye doctor was shocked at how bad my eyes were. My sight is now around 20/200 or 300, still pretty bad but much better than it was. I know just how precious eyesight is, it just shocks me that so many people are willing to take chances with theirs. I think “alan,” makes an excellent point. We could follow up with a series of volunteers as a study to add data. If the size is large enough and the data favorable over time, we could add the imprint of “harmless bodymod,” to it, or possibly find and refine weaknesses. On the plus side, the more people that do have the mod, the more statistically significant the results of any future study on this will be. Honestly, I think you (generic ModBlog you here) should stop publishing photos of eye tattoos. Although the posts always mention the risks, by publishing the photos at all, you are still promoting the procedure by saying how cool it looks. Even more than just saying “approach this with the utmost care” is still promotion. How about “do not get this done until we see what happens to the people who have already done it”? Obviously, this won’t stop anyone who is truly determined. I’d really like to hear whether Shannon is worried about blindness in his own case or whether the risk of permanently losing his vision (and never seeing his family again) was something that he considered when he had the procedure done. The rewards (tattooed eyes) just don’t seem to outweigh the risk (potential irreversible blindness) – I’d like to hear what made people go for this procedure. I hate to be a naysayer because at one point, every new body mod was probably considered super risky due to the unknown factor (like “Oh what’s going to happen from piercing my tongue? Will it ruin my tasting? Will I lose tongue function? Etc.) However, I think the eyeball tattoos run one of the highest potential risks, IMO. Eyesight is such a precious thing, and any side effect, no matter how small, is potentially life-changing. I personally would never dream of taking such a risk (I won’t even do Lasik because I’m afraid I’d be the 1 in 1,000,000 who goes blind from it) but to each his own. The body mod industry wouldn’t be where it is today if no one had ever taken risks, so…I guess we’ll see! I wish everyone with eye tattoos the absolute best. i would love to have this done but not yet for me. I agree with what phendraana said. Also, I can’t take that 2nd pic seriously, as the skin is violet too.=photoshop. Though I do love the colours. But what shades are they really? k : there were more pictures of this eye on max yampolskiy facebook, but it seems that he deleted all his profile. His facebook page doesn’t exist anymore. The skin is violet because of the light used on the picture (a blue/white light, maybe a LED lamp). @K-nap1 – thanks for additional info and photo, I don’t use facebook, never seen any other pics of this. I like that one you linked much better. Really cool. But still makes me feel slightly uneasy, because of the possible risks. Another question about eye tattooing. What about an eye tattooed with a “blacklight ink” ? I guess the eye should have a regular white color, but it should be very bright under blacklight. Did anyone do this? Thank you ffor this very informative article on eye tattoos. I would never consider it, or reccommend it either. To much of a risk, I think. UV Ink is still in the test stages and should be taken with precaution as it might effect the way light is accepted. I am the current owner of the Rainbow eyes. The labeling is wrong.